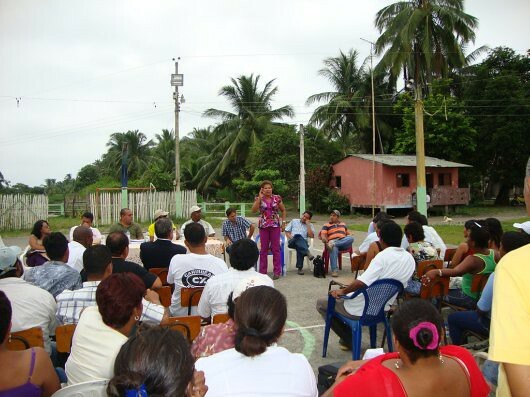 A woman speaking at a community meeting in Ecuador. Photo by Jordi Sánchez-Cuenca. Water and sanitation (watsan) projects in developing countries are rarely focused on governance. The sector is traditionally seen as an engineering issue, an approach that does not recognize the factors behind the failure of past infrastructure investments, often simple patches on systemic deficiencies. Indeed, watsan systems built in poor areas, more often than not, do not meet the specific needs of the population or collapse shortly after they begin to operate. In other cases poor communities are simply excluded from watsan investments. The reason for these failures is that infrastructure projects are planned, designed and constructed without an adequate participation of stakeholders, and governments and watsan operators are far from being capable of guaranteeing an adequate service provision. The watsan program I started to explain in my previous post is centered on governance rather than on hard infrastructure. The focus is, first, on institutionalizing participatory democracy in the sector’s decision making processes, in investments, watershed management and service provision, as a way to respond to real needs and opportunities and, more important, to ensure that the poor are not excluded. Second, the focus is on institutionalizing capacity building processes for national and local governments, watsan operators, civil society and academia. Like all 128 similar MDG-Fund programs in forty-nine different countries, this one is being implemented by Ecuador’s national government with United Nations support, totally aligned with Ecuador’s national policies, a structure that facilitates the sustainability of the impacts we expect to achieve. An intrinsic challenge to this approach is that governance of the watsan sector does not end at the community level. Communities themselves are weak in their governance; a few males usually dominate, imposing unfair roles and burdens inside the household and the community. Moreover, the traditional approach understands the sector as an engineering issue, a discipline traditionally reserved to men. The result of this is that women and children are not considered in decision making processes, from the household and the community to the professional and institutional levels. This situation demands a watsan approach that is intrinsically and explicitly gender sensitive. Indeed, there cannot be democratic governance and institutional strengthening without challenging unequal gender relations. This is particularly important in the watsan sector, but the approach can be extrapolated to any sector. These theoretical issues are the grounds on which the sixteen women we identified in the program’s four provinces and the six staff from national government counterparts will be helping in mainstreaming gender in the program. In order to achieve that, we have organized a capacity building workshop for these twenty two people, which will take place on the second, third and fourth of August. In this workshop participants will debate the links between gender and water, unify approaches and prepare a twelve-month plan to ensure that gender is mainstreamed at the local and national levels. The plan will be implemented inside the program’s provincial multi-stakeholder platforms (representing local governments, watsan utilities and civil society) and the national technical committee (representing three ministries and five United Nations agencies), the structure through which all implementation decisions are made. The women that we have identified at the local level regularly work in reducing gender inequalities, some at the community level and some at the provincial level, and the national government staff we identified are already gender sensitized. This means that participants will be arriving to the workshop with a base on which it will be constructing the knowledge and skills that are required for the challenge. Interview with a local leader in Esmeraldas, Eduador. Photo by Jordi Sánchez-Cuenca. Some of the participants, like Maria Lourdes, are from the provinces are part of civil society’s movements. Lourdes is a community educator working in an association of farmer women. She promotes women’s welfare in her community through educational workshops and claiming infrastructure and environmental improvements in their locality. She has been working for more than twelve years on these issues as part of several NGOs and also as a civil servant. We expect her to defend the community women’s point of view in the program’s decision making processes. Some of the women are local politicians. This is the case of Jasmina, a young elected president of a parish board, junta parroquial, the most local of the four government levels in Ecuador. She is also the founder of the local women association and represents the association of parish boards in her county, Cantón. She is particularly active in her province advocating for the well-being of her community, particularly women. We expect her to help the program insert the gender approach inside local governments’ watsan agenda. Another participant is Catalina, a women rights activist with a solid experience in her province, specifically on gender violence and maternity health. She was the president of her province’s Woman’s Forum, Foro de la Mujer, and today she is the president of her city’s users committee, defending the quality of basic services such as education, health care and watsan. She has good relations with the different government levels in her province, which will help the program in articulating local womens’ needs and priorities with provincial-level government structures and procedures. In my next post I will be explaining the experience of the workshop. Jordi, I really enjoyed reading about the different women participating in the workshop and the work that they do in their communities. It was very inspiring! Jordi I appreciate this post. I am wondering, what was the path to arriving at this governance approach? Did it take a few failures with the all-engineering approach for folks to realize that community buy-in and female leadership were key? Or do you think that the discipline of planning is taking a collective turn towards the idea that community-centric approaches in any project is the better approach? Thanks Aditi and Alexa for your comments. Regarding your question, Alexa, this governance approach has been long claimed by activists and specialized researchers. I can bring out Caren Levy, Leonie Sandercock and Iris Marion Young, for instance. Their argument is that gender is directly linked to the politics of planning and that women empowerment through participation in decision making processes is a required step to make governance more democratic. There have been plenty of failures in recent history that back up this argument. Despite that, most watsan projects still have an engineering approach. In our program, for instance, all hired staff has been technical until very recently, when senior officers started realizing that the sector needs people that think beyond infrastructure. Mainstreaming gender is a predefined strategy in our program and the program document had specific gender indicators. Most of these indicators are about gender participation in decision making processes in watsan utilities, communities and governments. Many of this kind of programs have similar gender mainstreaming strategies, but they need committed poeple as part of the team in order to have a real impact in gender terms. The initiative of capacitating women leaders from the provinces has been possible thanks to an order coming from UN-HABITAT’s regional office, who hired experts from GWA (not from the program’s funds) to help the program implement its gender strategy. To answer your last question, as a conclusion, planning is indeed slowly taking a collective turn towards a community-centred approach, but there is a long way ahead of us. The most important network representing this turn that I can think of is Slum/Shack Dwellers International (http://www.sdinet.org/). Thanks for the info Jordi. I didn’t know about http://www.sdinet.org/ but they look great. I hope that as planning makes this slow, collective turn, media will do the same. I hope that both practitioners and community residents will have the space to speak for themselves, share information, and tell their own stories.